The result was, admittedly, a surprise. With the Scottish National Party expected to clean up in Scotland, the Liberal Democrats collapsing and the Tories and Labour neck and neck, everybody predicted a hung parliament. There were some upsets, with high profile MPs for various parties suffering losses. But ultimately the Tories have cleaned up. Anecdotally, the main reactions to this from those who wanted the Tories out appear to be despair and blame. The despair is understandable. 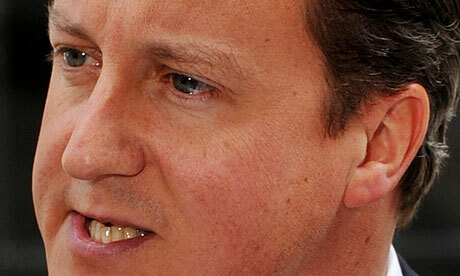 Ham-faced Tory leader David Cameron is already so smug that his head may be visibly growing. Everyone who isn’t rich, white, able-bodied and a million miles from the benefit system has good reason to fear that things are about to get an awful lot worse than they already are. Blame is born out of despair, but is far less understandable and in fact infuriatingly wrong-headed. Those who didn’t vote are first to have the finger pointed at them, of course. But quickly following them are those who didn’t vote properly, by voting for a TUSC or a Left Unity or a Green instead of Labour. Whether those who voted Labour where they should have tactically voted Lib Dem are also guilty is unclear, and probably too awkward to answer since the blamers invariably voted Labour. What we should make of those who couldn’t bring themselves to tactically vote Tory to keep out a UKIP MP with no chin doesn’t even get asked. Presumably because it highlights how hollow tactical voting can be for some, and diverts us away from finger-pointing which is no doubt cathartic when everything feels so bleak. But the finger-pointing also throws people under the bus who will suffer the most. In the run up to the election, those falsely equating turnout with whether you are listened to pointed out low turnouts among the unemployed and the young. Contrasted with high turnouts by pensioners, it essentially blamed those set to suffer vicious, punitive austerity under any government for their own predicament, while blithely ignoring the fact that pensioners (whose death rate in cold winters is unconscionable) are hardly living the high life as a result of voting. The other problem with all this blame is that it highlights just how weak our class is at this very moment. I previously noted that when Owen Jones claimed campaigns could not be won under a Tory government, he was sowing a dangerous illusion by obfuscating the true source of working class power (ourselves, as a collective). The blame game indicates that the illusion is deeply embedded. It’s not hard to see why. We’ve already had five years of Tory-led government, implementing vicious austerity measures. Job losses, benefit cuts, increased food bank usage, suicides over benefit sanctions, and pay and pension freezes. In response, that lumbering monolith known as ‘the left’ has failed to do very much at all. There’s been resistance, and it has been fierce. In the workplace and in the community, people have taken direct action for the living wage, for housing, against the Bedroom Tax, against evictions and against workfare. There have been victories, and there is reason to take inspiration from what those involved in these campaigns have done. But what is telling is that this has largely been independent of the left. We’re often told that the trade unions are the largest mass, democratic movement in Britain. This isn’t exactly true since it overlooks that activists are still a minority among the 7 million-or-so members of the unions. Nonetheless, it’s received wisdom and often one of the reasons we’re urged to vote Labour due to their formal ties to the unions. But how have they reacted to the attacks of the last five years? The exact nature of the trade unions was revealed when they had in their hands an enormous and growing fury at attacks on pensions early on in the coalition. This could have been the basis for a sustained resistance to austerity, and in their rhetoric the bureaucrats made exactly that claim. They then used two one day strikes, albeit large ones, several months apart as a pressure valve for that anger before making a sell-out deal and calling it a day. The left sects, meanwhile, along with various left ‘personalities’ continued to periodically offer us a ‘launch pad’ for mass struggles which turned out to be a platform for them to talk at us. Every few months, the ‘fight back’ would once more ‘begin’ with a top-table-dominated talking shop and if we were lucky we’d get an A to B march thrown in for good measure. Then it was only a matter of time before we were offered another ‘beginning.’ We got more reboots than a Hollywood movie franchise and no real efforts to build momentum. There’s no reason to expect any different under a Tory majority government. With union conferences coming up, expect emergency motions filled with sabre rattling rhetoric. Look forward to grand day out protest marches in London, ‘urgent’ conferences with long speaker line ups, and perhaps a couple of one day strikes carefully spread out over the next few years to avoid the risk of momentum or disruption. In other words, expect a holding pattern to manage working class anger until the next time we can be induced to vote for a Labour government. What we actually need instead of that should be clear enough, and would have been the same thing we needed had Labour formed a government instead – a mass movement effectively resisting the attacks that we face as a class and pushing for real positive improvements. There’s no point posturing about this. We’re not going to have a general strike, whether all out or a single day, out of thin air. The working class isn’t confident enough and it’s not in the interests of the trade union bureaucracy. Instead, this movement needs to begin with conversations. People talking to their friends, family, workmates and neighbours. Finding the problems they have in common, whether with a landlord, a boss, a local council or a service provider. Then taking direct action in order to impose their demands. We need to pick winnable battles, draw more people in by showing that our methods work, and escalate as our numbers grow. This is where our power as a class lies. Want an end to zero hour contracts? Build unions in the affected workplaces and defeat them with strikes and occupations. Want the Bedroom Tax gone? Resist every eviction with a ring of steel, refuse payment, show solidarity with the victims, and make the tax unworkable. Want to stop privatisation? We need strikes and occupations by the affected workers and to target the privateers with disruptive action that hurts their profits. I could go on. But the point is that there’s no one way to do this, no single blueprint for success. It relies on working class people working together and believing in their own power to force change – without representatives or intermediaries. This is the very essence of direct action. There are distractions from this on offer. Why don’t you join the Labour Party to help reclaim it? Why don’t you join TUSC or Left Unity to help it build a voter base? Why don’t you help us get different faces into the trade union bureaucracy? Why don’t you help us get people to this meeting in London where an important person can address them? None of it offers a way to advance the class struggle, only a way to divert energies down other avenues that present no threat to the status quo. So, with the voting done, the only effective thing we can do is build up resistance from the ground. Otherwise, in five years’ time, we’ll still have nothing else but the desperate, futile hope that Labour aren’t as bad. And make no mistake – that’s a sure sign of a broken movement. But ultimately the Tories have cleaned up. While this is the narrative, you have to remember what this means -- they have a working majority. This came as a surprise, sure, but hardly a win on the levels of 1983 or 1997. Looking at the results, you have to subtract the losses in Scotland to understand what is going on. Labour lost in Scotland because they worked with the Tories on the referendum campaign and because the SNP moved to its left (at least in rhetoric, partly in practice). Looking at the Labour results in England and Wales, they did gain seats -- but not enough. The predictable and predicted LibDem implosion was due to them working with the Tories -- they reaped as they sowed. Unfortunately, the benefits of that went mostly to the Tories as those who voted Libdem to keep the Tories out stopped. Hopefully this result will convince more people of the need for a strong anti-parliamentarian movement which can resist whatever party gets into office. The days of just voting and letting them get on with it need to end... we need to get on with that -- we would have needed to do that if labour had managed to get in. Don't disagree with any of this, but we have been trying for the past 5 years and the victories look like the slimmest of pickings. A couple of small victories for independent unions in the university sector (which haven't really spread or generalised, at least not out of London), some success for housing campaigners in London (probably the most encouraging thing, but still tiny), a handful of wage theft wins around the country (welcome, but it's hardly a groundswell). And that's about it. We all know where the cuts have fallen, and as you say the response from the unions has been pathetic. A handful of randomly called 1 day strikes - even if every union member in the country walked out - would achieve little more than saving the employers' wage bill. The problem isn't union tops faking it though, it's that the rank and file don't have the means, organusation or confidence to call their own actions. How do we go about achieving that, because the results to date have been negligible. I'm far more upset by the result of this election than an anarchist ought to be. I suppose I think that bloody Ed Miliband was considered too left-wing to be taken seriously, what chance do more radical ideas have? I wouldn't let it get to you that's the standard line taken against all Prominent or Popular Labour personalities. If anything this election proves how daft the line is.